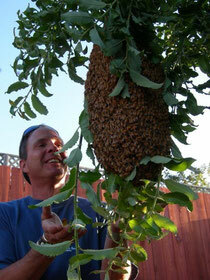 John McDonald founded SF Honey & Pollen Co. in 2006. His love for nature and the outdoors as well as his unforgiving curiosity, led him to the discovery of bees and honey. It began as a hobby and quickly evolved into something more. As he learned of the declining bee population and their important role in our everyday lives he made it his mission to become part of the urban beekeeping movement. He began his journey through a friend and fellow beekeeper, learning the ins-and-outs of beekeeping and everything he needed to get started. Soon, John built his own hive boxes and put three of them in the yard at his shop. Before he knew it, he was putting hives in the backyards of family, friends, and neighbors. This of course, left him with more honey than he knew what to do with. A business was born. He began bottling and selling his honey and teaching classes on beekeeping. He currently runs 50+ hives in San Francisco and the surrounding Bay Area, helping to keep local organic farms alive through pollination!